Debra Oswald has been writing since she was a teenager and is perhaps best known for her scriptwriting for both stage and screen (she is the creator and main writer of the TV series Offspring). In 2015, Oswald released her first novel for adults, Useful, a humorous and entertaining story about finding the meaning of life. Oswald’s second foray into adult fiction is a more serious tale of what can happen when you try too hard to protect the ones you love. 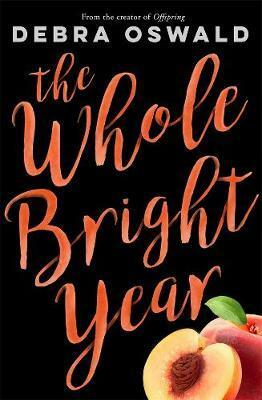 Set in the summer of 1976, The Whole Bright Year, is the story of single mother Celia and her teenage daughter Zoe. Before she was born, Zoe’s father was killed in an armed robbery. Heartbroken, Celia decided to move from the city and raise her daughter on a stone-fruit farm in the country. For 16 years mother and daughter share a close bond. Things change when two itinerant workers arrive to help with the peach harvest. Sheena has also decided to get out of the city in order to keep her younger, 18-year-old brother, Kieran, out of trouble. When Sheena’s car breaks down, the two are forced to seek work in order to pay for the repairs. Celia is at first wary of the pair, but having no other help on hand and a crop of peaches to be picked, she agrees to hire them. Zoe and Kieran are instantly attracted to each other and a relationship develops, to the concern of both Celia and Sheena. The trouble begins when Celia, in an effort to protect her daughter, decides to take matters in hand. Given Oswald’s background, it should come as no surprise that The Whole Bright Year is a great drama and a thoroughly enjoyable read, with a few twists and turns towards the end, just to keep the reader guessing. Sharon Peterson is the assistant manager at Readings Carlton.